Wedding dress and other wedding fashion trends alike have been changing through time in accordance with current fashion trends. 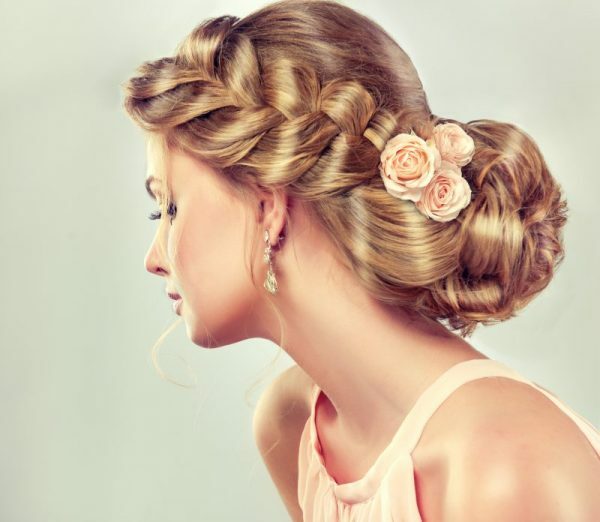 Wedding hairstyle trends not being an exception. Each decade brought certain trending wedding hairstyles that brides around the world wanted to follow. The Jackie Kennedy influenced 1960s presented many brides with beehive hairstyles and high volumes. They were accompanied by veils high on the top of the head and pillbox hats. The 1970s were influenced by a bohemian and free wave. The wedding hairstyles became more relaxed with this mindset as well. Very popular were loose hair with soft bangs. As for hair accessories, veils with laced edges and flowers were put in the hair to enhance the relaxed effect. The 1980s were vibrant and colorful in all fashion aspects. It was all about bigger, curlier and more voluminous hairstyles. Shorter, yet bigger haircuts and dramatically huge bangs are what the brides were aspiring to achieve on their wedding day. Increasing in size was not just the hair, but the accessories as well. Veils had gotten longer and bigger. The peak of the decade was certainly Princess Di’s 24-foot veil flowing behind the couple in St Paul’s Cathedral. Then came the sleek 1990s. They were all about silky hair and long bangs. Remember the Friend Rachel, portrayed by Jennifer Anniston? She basically created that hairstyle. Accessory wise, clip-on hair accessories and simple veils were beautifying the wedding hair in this decade. A knotted bun at the nape of the neck become popular in this decade. 1920s style headbands became popular again. But this time, they were worn on the top of the head, not on the forehead. Since straighteners became the prime hair styling accessory of every bathroom, sleek straight hair was the hair preparation method of choice in the 2000s. This decade has introduced a relaxed, beachy wedding hair style. A natural messy chic is the style to give your hair on your wedding day. Kate Middleton is representative of the natural looking wedding hair style. As for the accessories, braids and flower crowns have become extremely popular. And they admittedly make for amazing photos on your social media accounts. Watch the video where the model will take you on a journey through time as she makes an intriguing transformation from one style to another in just two minutes. Watch a quick preview of wedding hairstyle history in the following Wedding hairstyles through the Ages video. Enjoy!